Spray waffle iron with nonstick cooking spray and preheat it. In a mixing bowl, combine oat bran, wheat germ, flour, baking powder, and brown sugar. Add milk, egg, and vegetable oil and stir until mixture is smooth. Stir in dried apricots. Measure 1/4 cup batter for each 4-inch waffle. 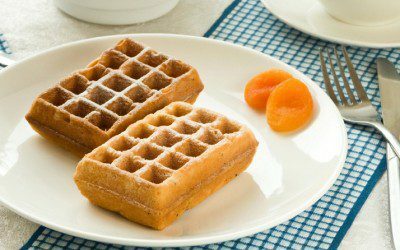 Cook waffles according to waffle machine manufacturer’s directions until they are golden brown. Serve immediately.